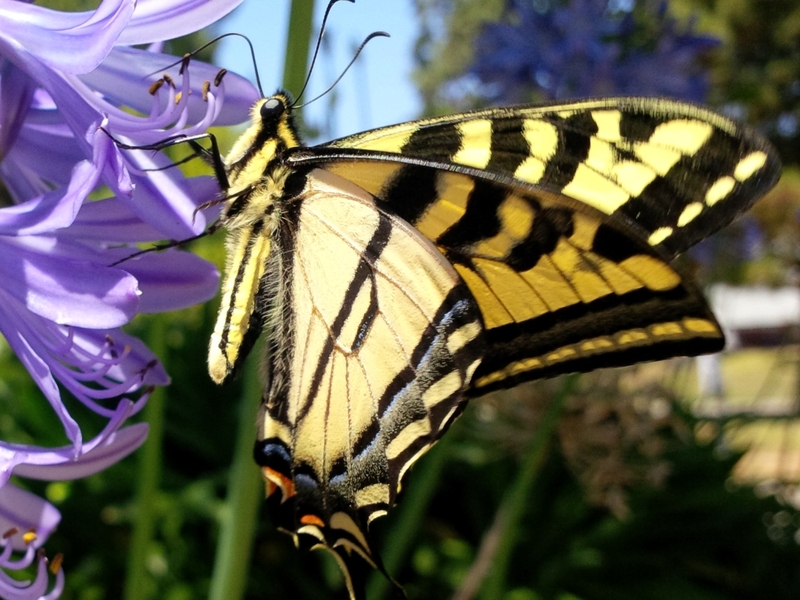 The Pale Swallowtail (P. eurymedon), Anise Swallowtail (P. zelicaon) and Two-tailed Swallowtail (P. Multicaudata) occur in the Bay Area. Larvae feed on foliage of deciduous trees, including cottonwood, birch, elms, willow, alder, sycamore, and aspen. Riparian areas near woodlands and other open areas. More common along streams where its host plants tend to be. Males patrol canyons and hilltops. Western North America east to the edge of the Rocky Mountains. June-July (one flight) in much of range, but much of year (2-4 flights) along Pacific coast. The eggs are deep green, shiny, and spherical. They are laid singly, on the undersides of leaves. The caterpillars emerge about four days later. Young caterpillars resemble bird droppings, and as they molt, they eventually turn bright green, with a pair of large yellow eyespots with black and blue pupils. They can feed on the leaves of a variety of trees, and the predominant food plant varies across their range; trees commonly used include cottonwood, willow, quaking aspen, and many others. The caterpillars molt five times, eventually reaching a length up to 5 cm before pupating. In summer, the butterfly can emerge as quickly as 15 days after the caterpillar pupated, but when the caterpillar pupates in the fall, the butterfly does not emerge until the spring. The chrysalis is green in summer and dark brown in winter, and looks like a piece of wood. Butterflies emerge from winter chrysalids between February and May, the date depending on the temperature, so they are seen earlier in the more southerly and more coastal parts of their range. The adult females lay up to a hundred eggs in total. The males often congregate, along with other species of swallowtail, at pools and along streams and rivers; they drink from the water and mud, extracting minerals, as well as moisture. Species Papilio rutulus - Western Tiger Swallowtail. (http://bugguide.net/node/view/24573). Accessed March 12, 2016. .
Papilio rutulus. (https://en.wikipedia.org/wiki/Papilio_rutulus). Accessed July 16, 2016.